Beyond providing data for all 32 NFL teams, PFF also supports network broadcasters with game-preview packets that are used to enhance the in-game experience for fans and viewers. This Falcons-Steelers preview features the same information our broadcast partners use for team research and in-game production. One of our most stable metrics for judging a quarterback is the performance from a clean pocket. 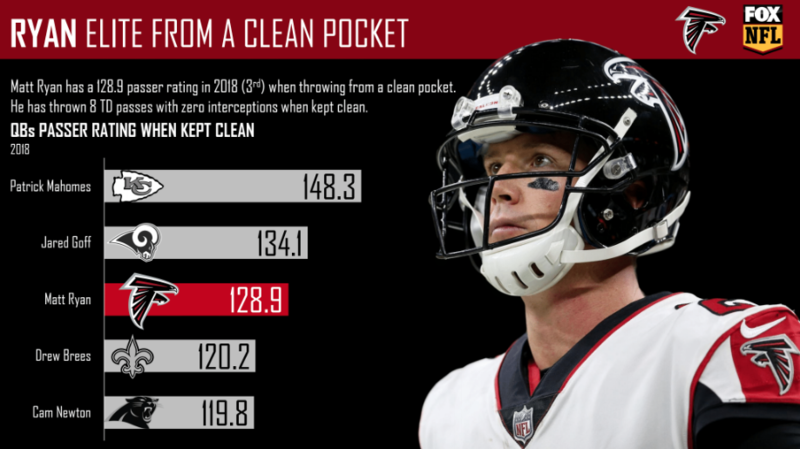 With that said, Matt Ryan‘s third-ranked passer rating of 128.9 from a clean pocket is no fluke. He has been one of the elite quarterbacks for a while now, and he should have a field day against the Steelers’ 26th-ranked coverage unit. Depending on who you ask, you may get different opinions on who is the best wide receiver in the NFL, but the debate about who has been the most productive on a route-by-route basis is an easy one. 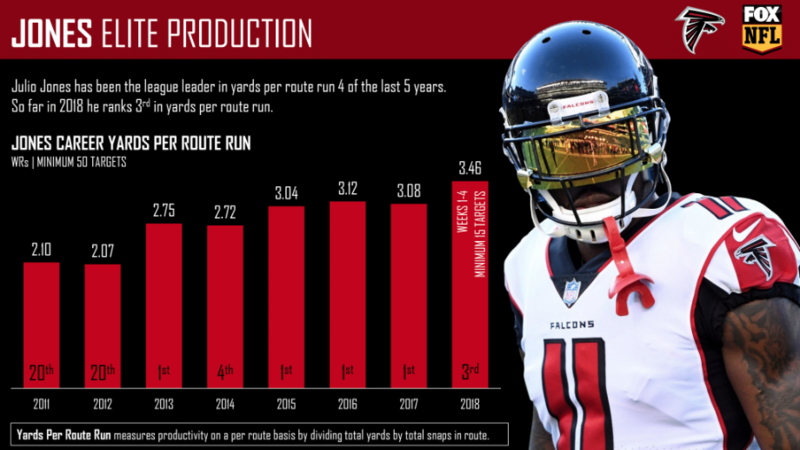 In the last six seasons, Julio Jones has led the NFL in yards per route run four times and finished in the top five twice. 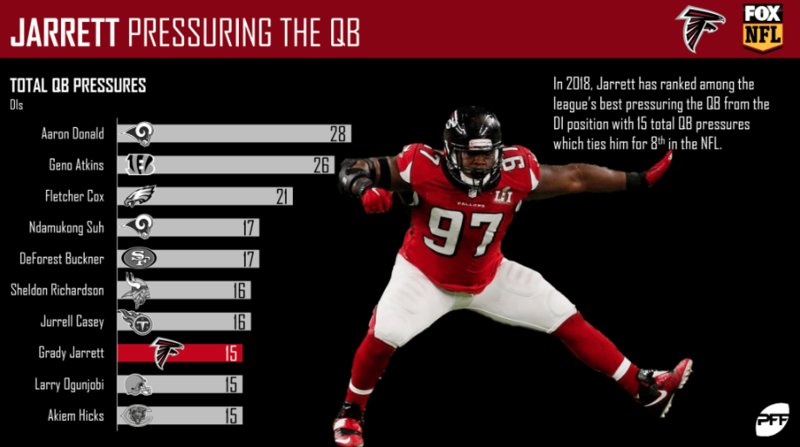 With 15 total pressures, Grady Jarrett has been one of the most productive pass-rushers at the interior defender position this year. In addition to being good against the pass, Grady has also been a force against the run; he has a run defense grade of 84.6, ranking 10th among interior defenders. Look for him to make some impact plays against the Steelers this weekend. 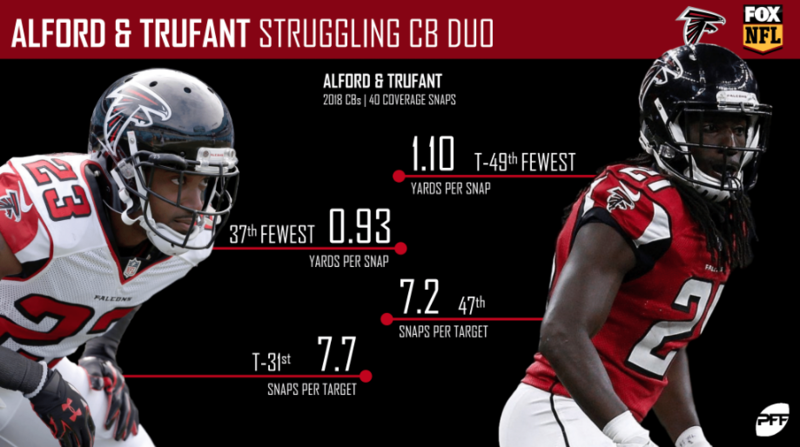 Robert Alford and Desmond Trufant both rank around the middle of the pack in yards allowed per coverage snap this season and they are set to face up against Antonio Brown, who is far from a middle-of-the-pack wide receiver. The Falcons’ cornerbacks will have to elevate their game if they want to contain the Steelers’ offense. 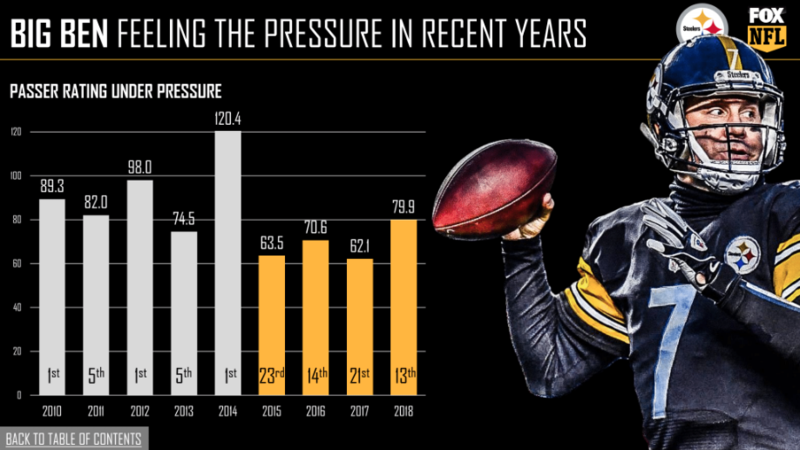 After ranking in the top five in passer rating under pressure from 2010 to 2014, Ben Roethlisberger has ranked 13th or worse in each of the past four seasons. 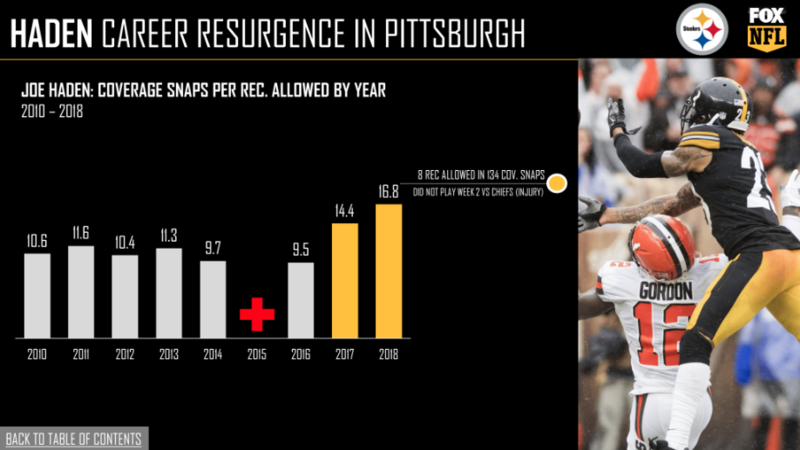 With Bell still absent and the Steelers’ sitting at the bottom of the AFC North, Ben Roethlisberger will need to turn back into “Big Ben” against the Falcons. James Conner has filled in admirably for Le’Veon Bell. 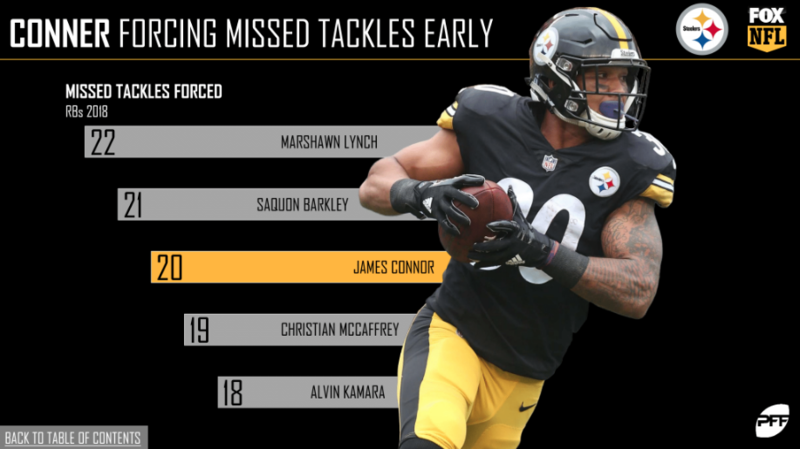 Trailing only “Beast Mode” and Saquon Barkley, Conner has forced the third-most missed tackles (20) among running backs this season. He has a rushing grade of 67.7, ranking 22nd out of 60 qualifying running backs this season. Le’Veon Bell’s rushing grade last season? 67.7. Last season, Pittsburgh pressured the quarterback on 41.1% of passing plays, which led the NFL. That includes leading the NFL in pressure rate on stunts (50.9%) and ranking sixth in pressure rate on blitzes (50.3%). 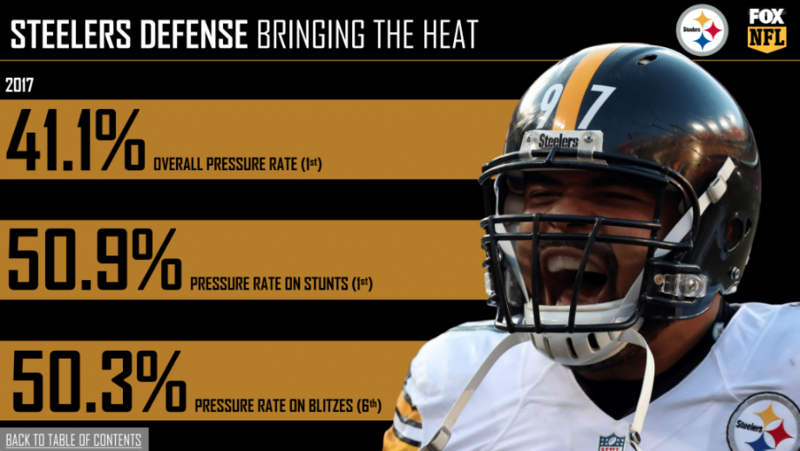 With the Steelers’ pass-rush unit ranking 23rd in pass-rush grade this season, they will likely have to go back to their 2017 ways and get creative with some stunts and blitzes if they want to apply some heat to Matty Ice. Joe Haden has drawn new life into his career since moving to Pittsburgh, as he ranked in the top 20 in coverage snaps per reception allowed among cornerbacks last season and currently ranks 14th this season. His stingy defense will certainly be needed against Julio Jones this week. 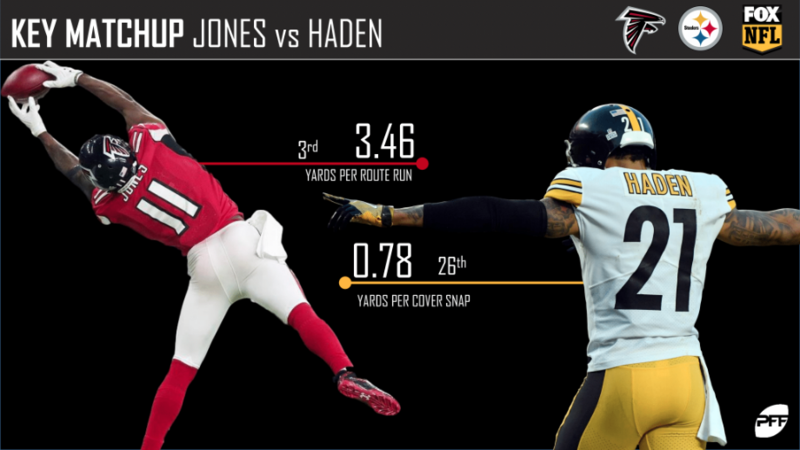 PFF Greenline has projections for the spread, moneyline and over/under of the Falcons’ matchup with the Steelers. Get its picks here.